Few weeks ago I received an invitation from the teaching council to the FEILTE 2013. I replied and confirmed my attendance to the event. At the time I thought: “Well why not! I might learn few interesting things.” It went beyond my expectations. After each workshop I took part in, each stand I visited and each presenter/teacher I talked to, I felt I had learnt something important, worth giving a shot and that I’d like to share (thus this article…). The event lasted the whole day but you can arrive/leave anytime you like. You can wander around the Royal Hospital Kilmainham AND you get free food and coffee/tea all day long! I only stayed for 4 hours, but it flew by so quickly. FEILTE seemed to me a great place to learn, share and talk to other teachers. I remember cycling home thinking: “Wow, I did not expect to be blown away by so many ideas.” So if you have not gone yet, I can only recommend you to try to attend it next year. TL21, “teaching and learning for the 21st century”: Collaborative professional development and research project between schools in the Leinster region and the Education Department of NUIM. Interesting topic to look into: “The Jigsaw technique” – http://www.jigsaw.org/overview.htm– Barrie Bennett, “Beyond Monet, The Artful Science of Instructional Integration” – www.nuim.ie/TL21/. Teach meet, “If your idea works in your class, then share it!”: Gathering of teachers to share current effective ideas for the classroom. Share activities, ideas, experience, examples… No sale involved. Very short presentations. Check the introductory video on www.irishteachmeet.wikispaces.com and videos from past teach meets on www.teachmeettv.edutronic.net. We have so many hidden talents in our schools. Here is a way to help them be acknowledged. Young social innovators, “Another great idea for TY students!”: Youth led. Team Based. Working in teams of 5-25 young people identify a social issue of concern to them and/or their community or further afield, explore it and come up with innovative actions and responses which they put into practice. – http://www.youngsocialinnovators.ie. 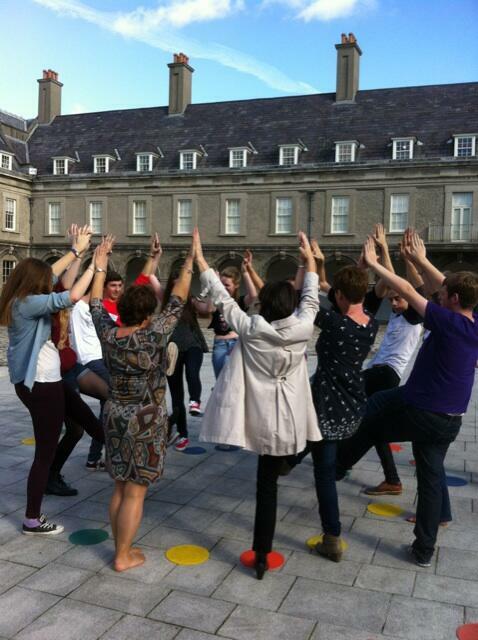 IPPEA, “Irish Primary PE association”: We jumped and danced in the courtyard of the Royal hospital. Even learnt few interesting activities I could definitely use in my French class. 10 euros membership for a year and you get access to all their resources. www.irishprimarype.com. Yes! Teachers as well can have fun dancing, running and enjoying a nice Yoga session under the sun. Irish Deaf Kids, “supporting inclusive education”: Caroline Carswell (infor@irishdeafkids.ie) is more than happy to come talk to TY students and organise workshops in the schools. – www.irishdeafkids.ie. Access to online research on EBSCO, “Plenty of bedside table reading!”: Registered teacher have now access to the EBSCO education source package, a collection of over 1700 journals and a selection of eBooks in the field of education. – Log in with your Registration number to the teaching council registration website and access the resources. – www.gemini.teachingcouncil.ie/services/p_wwv_tc_logon. .ThatQuiz.org, “Create & share quiz”: Mostly used for Science, Maths, Languages and Geography, but can be used for any other subjects as long as you have the ideas! You can create an account, set up tests online that your students will take (in computer room or from home), results are savec in your teacher account. http://www.thatquiz.org. Thanks for reading and I wish you all an amazing school year with plenty of great ideas!